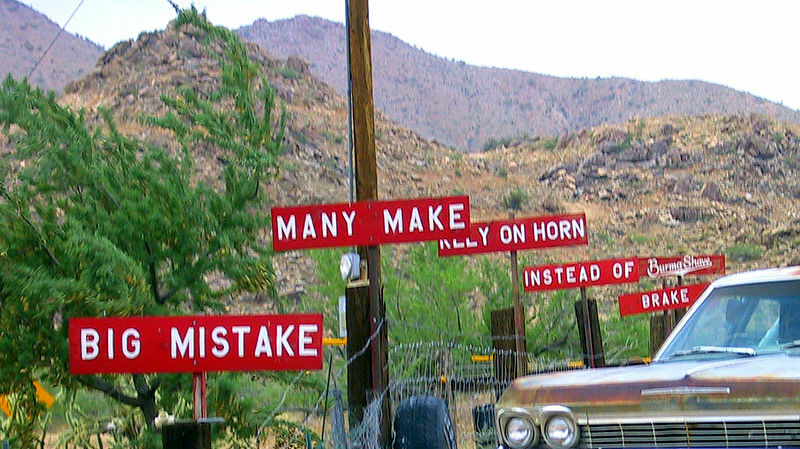 Burma-Shave sign series appeared from 1925 to 1963 in most of the contiguous United States. The exceptions were New Mexico, Arizona, and Nevada (deemed to have insufficient road traffic), and Massachusetts (eliminated due to that state's high land rentals and roadside foliage). Typically, six consecutive small signs would be posted along the edge of highways, spaced for sequential reading by passing motorists. The last sign was almost always the name of the product. The signs were originally produced in two color combinations: red-and-white and orange-and-black, though the latter was eliminated after a few years. A special white-on-blue set of signs was developed for South Dakota, which restricted the color red on roadside signs to official warning notices.